The book 1066 and All That has one of my favourite subtitles: “A memorable history of England, comprising all the parts you can remember including 103 good things, five bad kings, and two genuine dates”. The preface does not specify whether it was Walter Carruthers Sellar or Robert Julian Yeatman doing the signing or the losing. Nor does the Compulsory Preface (this means you) cast further light upon this circumstance, either, although it is more specific as to the purpose of the book. History is “…what you can remember.” This salient volume certainly does contain the history I remember, including the Venomous Bead, the Disillusion of the Monasteries, and the Industrial Revelation. The two dates are, of course, 1066 (it’s in the title and is memorable for the Battle of Hastings; this post published on around about the 948th anniversary of that Battle) and 55 BC (when Julius Caesar master-minded the first Roman invasion of Britain). However, Caesar was compelled, the book reminds us, to invade Britain again the following year — 54 BC, not 56 — owing to the peculiar Roman method of counting backwards. The ever-informative book’s preface mentions that originally the authors planned to include two other dates, but last-moment research (at the Eton and Harrow match) revealed that they were simply not memorable. If the first edition printed on rice paper and bound in buck-boards ever turns up in the back of a taxi, I will be very surprised. a) A surfeit of lampreys? 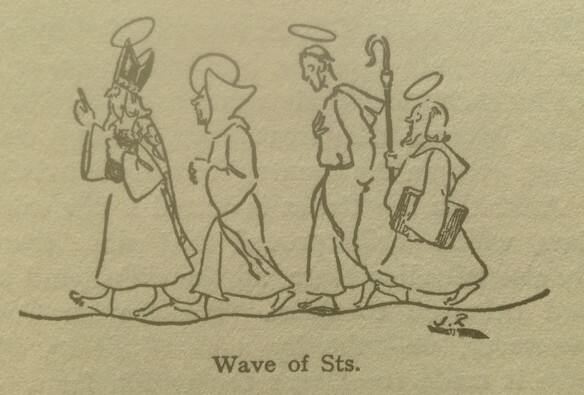 b) A wave of saints? This entry was posted in Misplaced manuscripts and tagged lampreys, mythical on 14 October, 2014 by Horatia.